Dr. Couture's talk will discuss the increasingly frequent practice of Indigenous land acknowledgments in Canadian society and what implications this might have for local practices in the Bay Area. Through an engagement with methods and theoretical understandings from the field of performance studies, she examines when and how land acknowledgments can be decolonizing and when they can contribute to the continuation of settler colonial logics of whiteness. 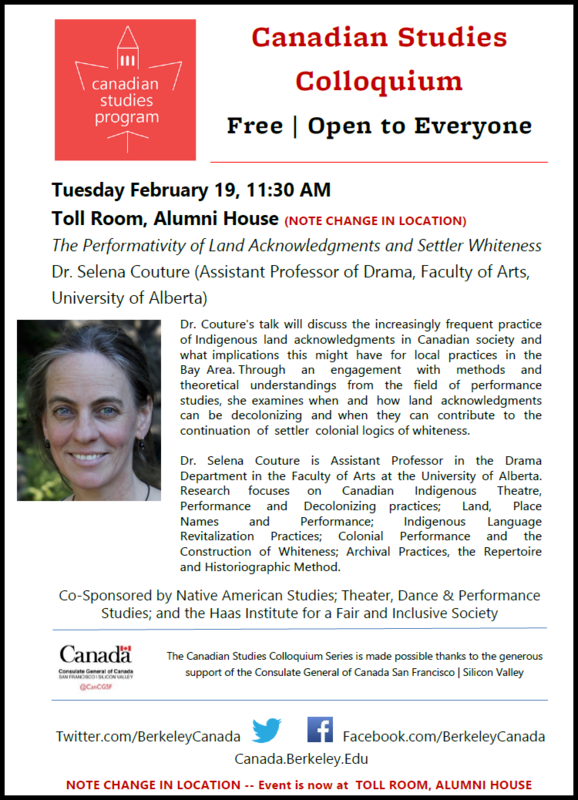 Dr. Selena Couture is Assistant Professor in the Drama Department in the Faculty of Arts at the University of Alberta. Research focuses on Canadian Indigenous Theatre, Performance and Decolonizing practices; Land, Place Names and Performance; Indigenous Language Revitalization Practices; Colonial Performance and the Construction of Whiteness; Archival Practices, the Repertoire and Historiographic Method.